JAKARTA: China and Japan are locked in an increasingly heated contest to build Indonesia’s first high-speed railway, with the Asian giants sweetening deals and turning up the charm as time runs out to woo Jakarta. President Joko Widodo stoked the competitive spirit of the two Asian powerhouses as he toured China and Japan in April trying to drum up much-needed investment for a multi-billion dollar overhaul of Indonesia’s ageing infrastructure. In both Beijing and Tokyo, he boarded bullet trains and declared his vision for high-speed rail in Indonesia: a line connecting the sprawling capital Jakarta with Bandung, a mountain-fringed city famed for its universities and IT expertise about 160 kilometres (100 miles) away. “Let them race to invest in Indonesia. It’s good for us,” Luhut Panjaitan, chief political minister and a close aide to Widodo, told AFP. 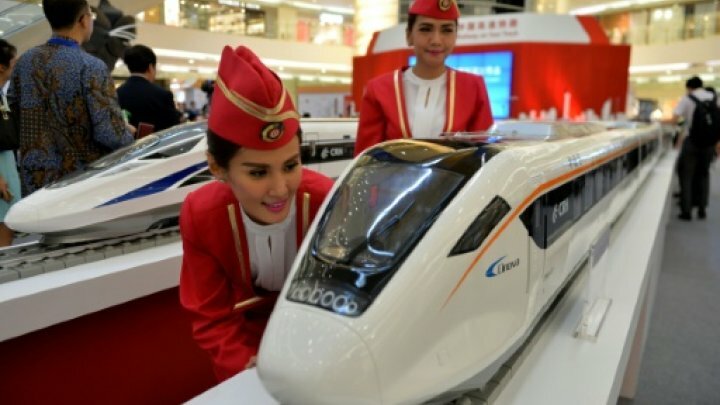 Beijing recently showcased its high-speed rail prowess in an exhibition at a plush Jakarta mall, where China’s ambassador to Indonesia likened the project to a child reared by Jakarta and Beijing. “Our number one priority is to ensure the baby’s health and growth, rather than to rush him to make money to support the family,” Xie Feng said, playing down suggestions China’s main motive in this project was profit. Japan’s proposal is slightly more expensive than its rival, and it is only promising trains will hit the tracks in 2021. On the plus side, it has offered a lower interest rate of 0.1 percent, a fraction of the 2.0 percent China has put forward. China has countered this by arguing it has built 17,000 kilometres of high-speed railway — or 55 percent of the world total — in the 12 years since it began constructing bullet trains. A government source tasked with assessing the two proposals told AFP China’s slowing economy had fostered doubt about whether Beijing could deliver on its ambitious promises. China’s economy expanded 7.4 percent last year, the weakest pace since 1990, and slowed further to 7.0 percent in the first two quarters of this year. Indonesia had also “learned the lessons” of dealing with China, the source said, with past investment pledges failing to materialise and newly-constructed power plants lacking the capacity promised on paper. A senior official described the matter as “sensitive”, acknowledging the importance of both China and Japan to Indonesia, while other voices are also urging the president to tread carefully.